At last—an extensive resource for natural horsekeeping! 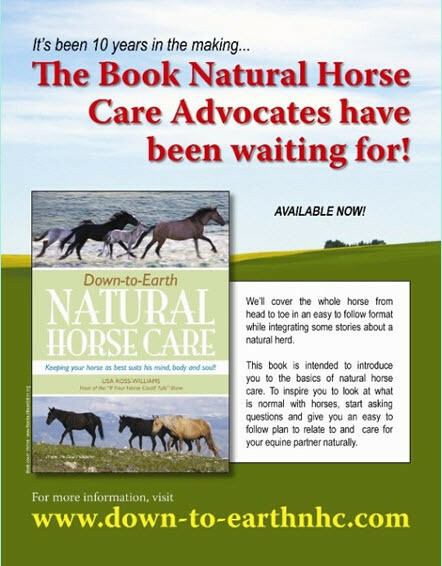 “Down-to-Earth Natural Horse Care” is bound to become your complete ‘go-to’ reference source for providing your Equine companion a natural health regime and environment — literally from his feet to his mind. Our lifestyles are shifting, and we find ourselves making conscientious choices about ‘natural’ selections for ourselves, our families, and our companion animals — and now with the help of this in-depth book, we can make those choices for our horses too. By providing the very best for our horse’s environment, nutrition, training, and health care, we discover that ‘natural’ is the ultimate choice — and often the most simple and cost effective. “Down-to-Earth Natural Horse Care” is an all-inclusive guide with easy-to-implement ‘natural’ suggestions for a healthy body and mind. Author Lisa Ross-Williams, one of the horse industry’s leaders in natural horse care, provides us with an easy-to-follow road map for crafting a natural approach with everything we do for our horses.